It’s 24 by way of Rashomon in this high concept thriller, which sees the assassination of William Hurt’s American president during a summit in Spain. Vantage Point offers the same incident from multiple perspectives; just when you think you know what’s going on the narrative reboots to minute one, whereupon another character’s account adds an entirely new direction to the labyrinthine plot. At least that’s the idea. This kind of high concept movie needs a superior script, and this is where Vantage Point skids off coarse somewhat. The various perspectives offer little in the way of revelation; by the third “rewind” we can but wonder why the film didn’t concentrate on one fleshed out character. There’s only so many ways we can witness the same shooting before deja vu becomes stale monotony. Director Pete Travis, having worked his way up from shows such as The Bill and Cold Feet, realises this too, abandoning the format by the third act, in favour of a lengthy car chase in which countless civilians lose their lives in the name of law enforced pursuit. The cast is a good one, but mostly wasted on extraneous subplots that do little other than accentuate the diabolical deviousness of Western society’s favourite bogeyman; the Asian terrorist. Confused as to who the bad guys are? Look for the one’s spouting subtitles. 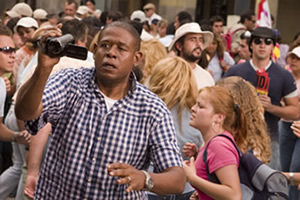 Forrest Whitaker’s amiable American tourist serves no real purpose but to represent the “little guy,” while Sigourney Weaver’s TV news producer exposition is repeated elsewhere. It’s nice to see Dennis Quaid’s back in a semi-decent movie, as Secret Service agent Thomas Barnes, a pill-popping wreck since he took a bullet for the president – surely every secret agent man’s dream. Predictably, Barnes is again given opportunity to prove himself an American hero. Despite its intentions as an intelligent actioner, Vantage Point tumbles at the pay off, shamelessly plugging its plot holes with the usual cinematic clichés. There’s a family man who develops a disturbing infatuation with a ten year-old girl for no other reason than to save her from the inevitable danger we know she will later be encounter. Then there’s the terrorist willing to blow up a stadium of several thousands, who swerves his car into a brick wall to avoid running over said little girl. Quaid’s aged Secret Service agent is capable of outrunning a police vehicle and surviving a car crash virtually unscathed; he’s driven to save the president, see. But zealous dissection of Vantage Point is senseless. It’s a by-the-numbers popcorn flick made for the 300 generation, a marketable gimmick realised with total disregard for its sensitive and potentially relevant subject.